I’m happy to report that our children are in good health. Princess and Hilda, our cooks, prepare nutritious meals to satisfy their healthy appetites. We have been weighing and measuring the children once a month and it is wonderful to say how they are all growing taller and picking up weight. Even little Khaynisa who is 1 year and 4 months old who came to us weighing a slight 4.5kg is putting on weight steadily and has started to crawl. Xoliseka started to walk and is getting more confident by the day and then there is baby Michaela who took her first independent step today! What a privilege it is to witness this! Most of our school boys brought home good progress reports from school. A couple of the younger ones still want to play and are not interested in the academic side of life yet. We are encouraging them to do their best in the new school term. 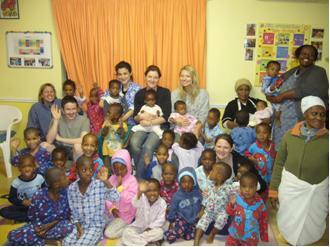 The 3 – 5 year old girls and boys went to The Giraffe House near Stellenbosch. The weather was rather cold that day but they were dressed warmly and had lots of fun learning about different animals and reptiles. A special thanks to AVIVA for supplying their vehicle and driver to us free of charge. 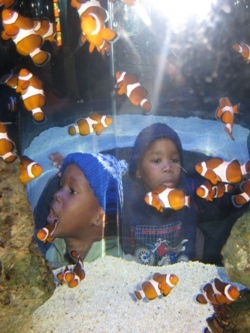 Not long after this, Natasha, who regular volunteer at Masigcine, arranged for our school boys to go to the Aquarium at the V & A Waterfront in Cape Town. What a treat! This was followed by lunch at a restaurant too. Natasha and her Mother paid for everything! Thank you so much for blessing our boys! At the end of April we said goodbye to Gloria (Meitie as she was fondly called) to pursue her career in nursing. She was an asset to Masigcine and we were sorry to see her go. We have 2 newcomers to our fold. Princess joined us in May and has proved to be a very good cook. Patricia, who is a qualified Child Care Worker, started with us in June. Both are fine women with a heart for children and we wish them a long and happy association with Masigcine. Our 3 – 5 year old children no longer attend the crèche in the area but rather follow a daily activity program with the help of the volunteers and the Child Care Workers. Delia Stanhope, a young retired school teacher from Cape Town, has offered her services to teach our young pre–Grade R children on a Monday, Wednesday and Friday morning. We are planning to convert the spacious shed in our backyard into a suitable classroom where the tuition will be done. This is an exciting development for Masigcine and will be extremely beneficial to our children in preparing them for when they have to start school. We have been truly blessed with the extra help we have been receiving from the international volunteers who have come from all over the world to offer their services here at Masigcine. In January 2009, AVIVA introduced our first two international volunteers to Masigcine...Amanda Watchom & Jennifer Parker, both from Canada. They were followed by volunteers from the UK; USA; Germany; Switzerland; Ireland; Australia; Holland; Netherlands and Brazil. And there are bookings right up until 2010! Their help is invaluable! Masigcine has been receiving many donations in the form of clothing, toys and other general items, for which we are extremely grateful. We are diligently sorting through these donations and where we find that we have an excess of an item, we are not hording it but rather redistributing it to other needy organizations or families in the area who can make use of it. Please continue to give...The heart of Masigcine is to share!